Galapagos Shark Diving actively supports conservation in Galapagos! Once you dive Galapagos your life and diving will NEVER be the same! The Galapagos Islands are a magical place. They offer diving with hammerhead, Galapagos & Silky sharks, Whale Sharks, turtles, Molas, Marine Iguanas, Eagle rays, dolphins, Jacks, Tuna, Red-lipped batfish and so much unique marine species. Occasionally we also find Orcas, Tiger Sharks, Humpback whales and other less frequently seen marine animals! WHY dive with US? How do we make the DIFFERENCE? YOU support the 'Galapagos Whale Shark Project' directly with a donation which is included in the price! For your support you will get a underwater video of your individual dive expedition! We give presentations about a variety of Galapagos topics, science and conservation of Whale Sharks & the Galapagos Whale Shark Project! We will have maximum of 14 passengers instead of 16 on board the vessel. You will dive with members of the research project GWSP Jonathan Green & Jenny Waack. So you will get details about the project and a few stories behind the scence of the filming of 'BBC Blue Planet II' directly from the project leader Jonathan. Both are dive masters! So you will have 4 dive masters in total - for 7 guests 2 dive masters! You can help with citizen science adding to the knowledge and global data bases. Interested in underwater photography? 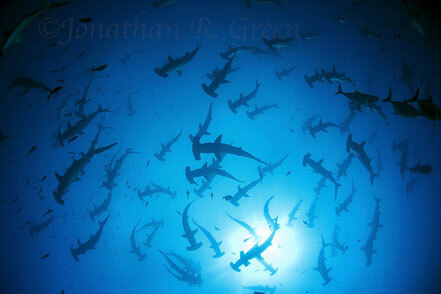 Jonathan is an award winning photographer, who has led many photography workshops in Galapagos and around the world. He will give you all the tips & tricks in a PHOTOGRAPHY WORKSHOP and practical advice about photography on land and underwater directly onboard. All included in the trip cost. Why these dates? We take into consideration local and climatic conditions to optimise our wildlife encounters! We offer translation onboard in Spanish, German and French. Superior Touristclass ship & itinary with the widest varity of dive sides! Including possible dives with whale sharks, sunfish, marine iguanas, hammerheads & many other sharks, penguins and lots more! It sails to WOLF & DARWIN, THE HOTSPOT for HAMMERHEAD & WHALE SHARKS! It visits dive sites for MOLAS and MARINE IGUANAS! It offers ALL the dives and services of the other dive vessels in the Galapagos and YOU CAN'T BEAT OUR PRICE! Luxury ship & itinary with 4 days Wolf & Darwin Island! Increase your change to dive with whale sharks and hundreds of hammerheads by staying longer in this magical places! It is one of few vessels that sails to WOLF & DARWIN, THE HOTSPOT for HAMMERHEAD & WHALE SHARKS! It is one of the few boats that gives us 4 full days in Wolf & Darwin - 1 extra day compared to most of the other vessels! So the chance to see whale sharks increases. Offers a comfortable and luxurious adventure in Galapagos! WHO are we and WHY we loving what we do? Jenny Waack & Jonathan R. Green are founder of Galapagos Shark Diving. We offer dive expeditions to support a for us really important research project - the Galapagos Whale Shark Project. Both of us fell in love with whale sharks and the marine environment, dedicating our lives to protect these gentle giants and the oceans. More information to our history here. ... offer DIVING WITH A PURPOSE - combine an incredible dive experience with helping research & conservation of whale sharks! ... make the world aware of the endangered status of whale sharks, show how everybody can help in giving more detailed information about these gentle giants of the oceans. 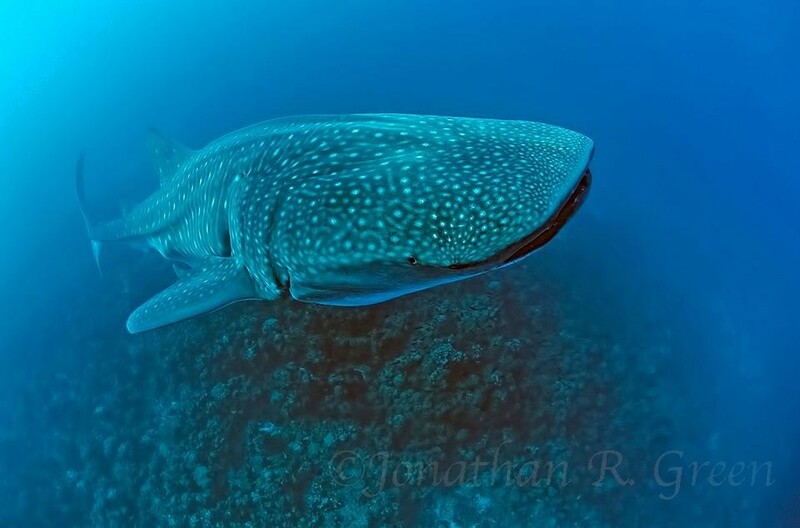 ... let the world know about the Galapagos Whale Shark Project, its positive impact & support the project directly. ... show YOU how you can do citizen science and support a lot of shark species. ... give us the possibility to dedicate more time to the project and the conservation of whale sharks. ... give back to nature & marine life!